Display a Black Tip Tray, a Postcard with Dice printed on it and an empty Shot Glass. Place the Postcard on the Tray. Place the Shot Glass up-side-down on top of the Postcard. Holding the Tray, Card and Glass in one hand. Your other hand reaches into the air and finds an invisible coin. Toss this coin at the glass and a Clink is heard as the Coin Appears under the shot glass. Clink, Clink and another Click, you Magically produce four coins, under the shot glass, one at a time, to complete this fun game with audience participation. Use your own coins- USA Quarter size, and any shot glass. 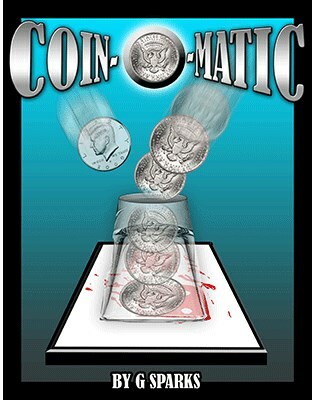 Coin-O-Matic comes with the Magic Tray and Postcard.